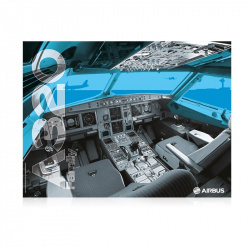 This unique poster displaying the detailed cockpit of the Airbus A320 is perfect for anyone with dreams of being a pilot. The high-quality glossy print is ideal for office or home. Poster format: 80 x 60 cm. "The best keep getting better". 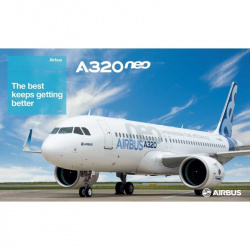 This unique poster displaying a picture of the A320neo on the ground is perfect for anyone with dreams of being a pilot. The high-quality glossy print is ideal for office or home. Poster format: 100 x 60 cm. 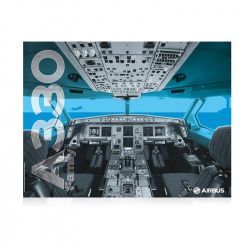 This unique poster displaying the detailed cockpit of the Airbus A330 is perfect for anyone with dreams of being a pilot. The high-quality glossy print is ideal for office or home. "Powering into the future". This unique poster displaying a rendering of the future A330neo is perfect for anyone with dreams of being a pilot. The high-quality glossy print is ideal for office or home. 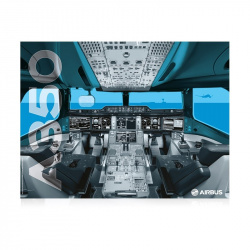 This unique poster displaying the detailed cockpit of the Airbus A350 XWB is perfect for anyone with dreams of being a pilot. The high-quality glossy print is ideal for office or home. 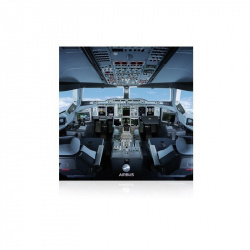 This unique poster displaying the detailed cockpit of the Airbus A380 is perfect for anyone with dreams of being a pilot. The high-quality glossy print is ideal for office or home. This unique poster displaying the detailed cockpit of the Airbus A380 - the most spacious and efficient airliner ever conceived - is perfect for anyone with dreams of being a pilot. The high-quality glossy print is ideal for office or home. Poster format: 60 x 60 cm. "Own the sky". This unique poster displaying a picture on the sky of the A380 is perfect for anyone with dreams of being a pilot. The high-quality glossy print is ideal for office or home. Poster format approx: 100 x 60 cm.